If you're serious about dog agility then you'll love the quality of this competition teeter base. Fully compliant for competition use with all major agility organizations (including AKC, USDAA, CPE). Sleek looking all aluminum construction will never rust and never needs painting. Quality design and choice materials makes for a lightweight, ridged, and strong base that will withstand heavy use. The plank can be quickly and easily removed from the base with the included Quick Release hinge. Base feet have slight bend which helps to stabilize it on uneven surfaces. The side-bars extend past the width of the plank so the dog sees the center point (requirement in AKC competitions). Heavy-weight chain and carabineers allows for infinite adjustments up to 24" high. Includes a stabilizer bar which allows you to easily move this obstacle (when attached to a plank) without having to reset the height. Will work with any plank, whether wood or aluminum. Includes detailed instructions and training tips. Important: This is the base only. To complete the teeter, you will need a plank. 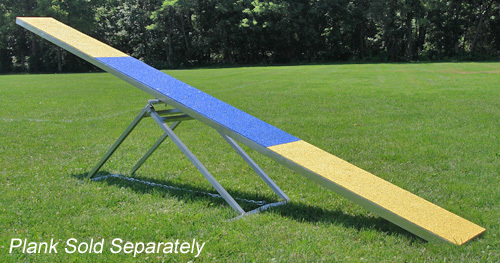 You can buy our Competition Seesaw Plank, or do it yourself!